It’s been almost a year since the denizens of Poldark‘s cozy corner of Cornwall graced American shores, what with all their brooding tension and questionable costuming choices. Rumors are flying in the British press about the second season, so why not indulge in a little speculation for fans on this side of the pond? That’s at the earliest. And that’s in the UK. So I’d guess January 2017 for PBS Masterpiece here in the states (however, that’s wild speculation on my part). Conveniently, much of the season 2 filming occurred during fall and winter 2015 to 2016, so the whole thing will have an autumnal look and feel. But that may mean less shirtless scything (awww). I don’t know what that means exactly — just that it’s not out in the fields. And they will be high quality. So, um, artistic? Crucial to the plot? Maybe Ross becomes a studio model and Demelza takes up painting? Joining the folks in Cornwall is Caroline Penvenen (played by Gabriella Wilde), who will up the style game. Maybe. Her character has some money and she’s upper-class, so supposedly she’ll be wearing fancy clothes. 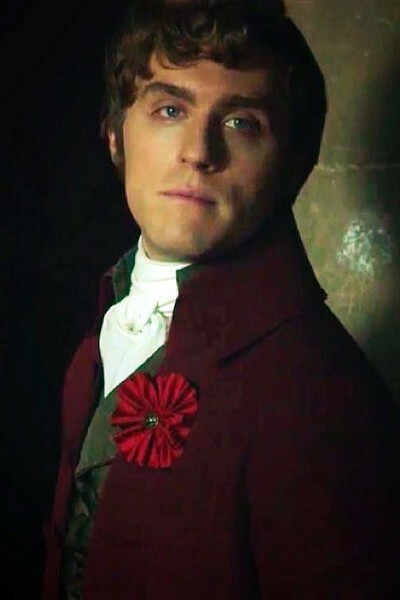 But let’s remember series one’s costuming ups and downs and not get our hopes up too high. 5. 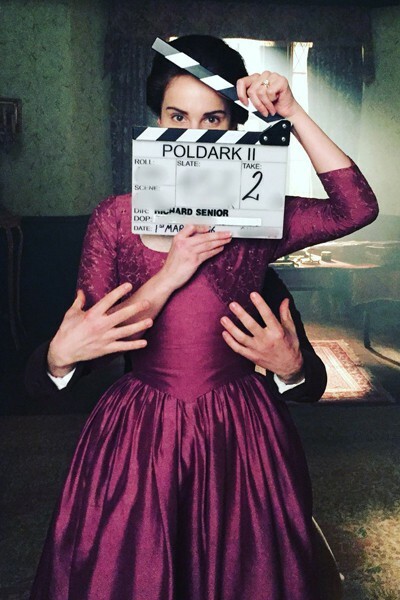 We Do Have BTS Poldark Season 2 Pix! What do they mean? What are they from? I don’t know, but let’s all try to guess! I bet they didn’t rent a wind machine for that effect. And the Great Bobby Pin Shortage of the 2000s strikes again! Crew guy is not impressed by all this twu wuv. 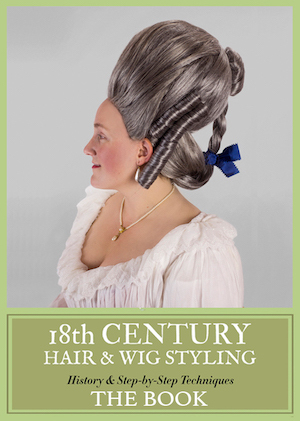 Oh Elizabeth, is that the only style you wear? Yep, Demelza is preggers again (c’mon, if you shag that much, it’s gonna happen!). 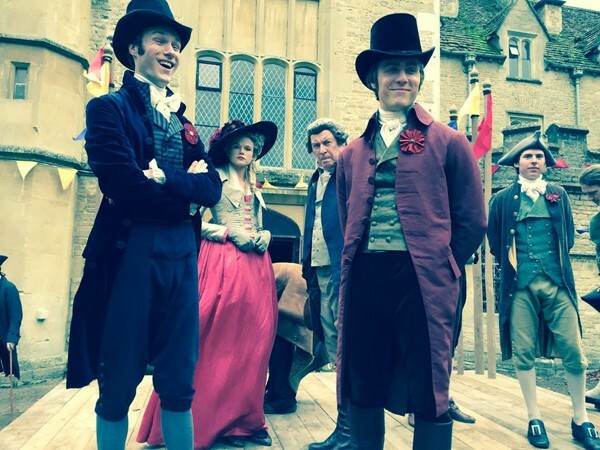 Are you excited for more Poldark? Well, an election plays a prominent role in the third book … hence the “embellishment” on George (my caffeine hasn’t kicked in yet). 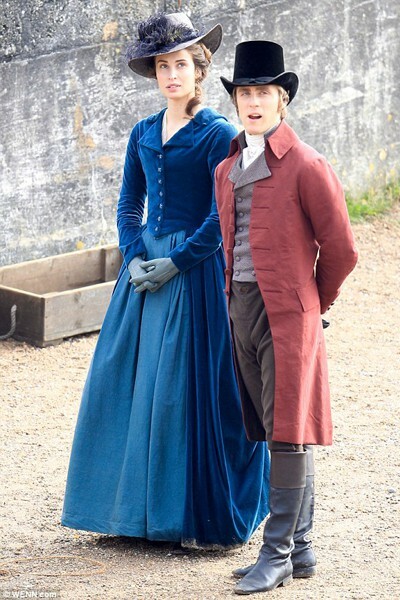 I also read somewhere that there is a new costume designer for series 2 … the Caroline character defintely paints the local Cornwall society as nowhere near London or high society standards. I can’t wait for Season 2. Sunday nights feel rather bereft these days. Yes, I am waiting for season 2. Maybe we should send these women Bobby pins. Or hire Bobby pin forgers and create a black market for them? 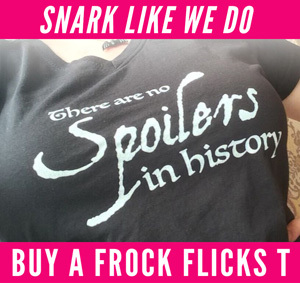 *she says with a straight face while chuckling inside. Seriously though, hope the costumes are better than last season. Maybe they could rent ones from the Duchess and Notorious Lady S.
A spokesperson for PBS have confirmed that the US will be getting Season 2 this year but cannot give us a definite date yet. We are hoping that it may even run quite close with the UK which recently happened with Granchester. 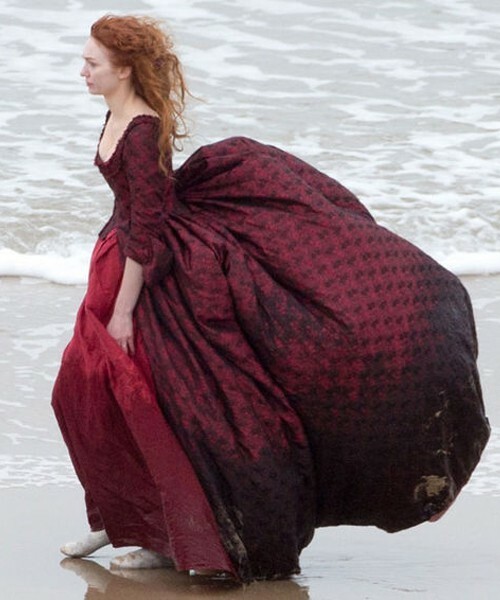 The hot with the dress billowing out is really coot, but all the sand and water on the bottom part of it just makes me cringe. That Bobby Pin Shortage photo looks a bit Laura Ashley photoshoot, circa 1975, doesn’t it? You might be onto something, Daniel. But all they would need is flowers in their hair to look almost Woodstockian. You know, peace, love, freedom, etc. That is the only style she can afford at the moment, thanks to Francis’ money problems.